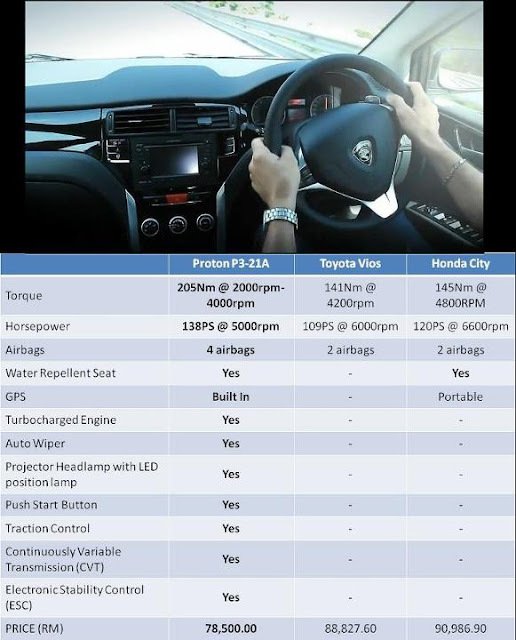 The much awaited Proton P3-21A has been a hype from the day it was showcased during the roadshow at Bukit Jalil. The car was heavily masked as shown in this photo at Paultan.org. Unmasked, this is how the P3-21A, or otherwise known officially as Proton Preve, looks like. Touted to be the replacement for the Persona or Waja, this car surely have some impressive specs for the racer boy. In fact, it is being compared to the other two compact sedan by Toyota and Honda. If the specs is true, then the Japanese will be in for a surprise dip in sales soon. From some site in Facebook. Taken from the same website above. 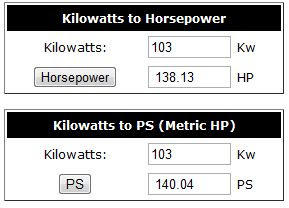 However, note that unit conversion to PS is not accurate. Also, if the replacement is for Waja, then it should be compared against Altis and Civic. No doubt Preve will have a huge advantage with pricing. Malaysians love their cars and somehow, information such as these WILL leak out. SO, someone working in Proton has perhaps, "left" the full spec sheet, on the table during one of his/her Teh Tarik Session (TTS) perhaps. 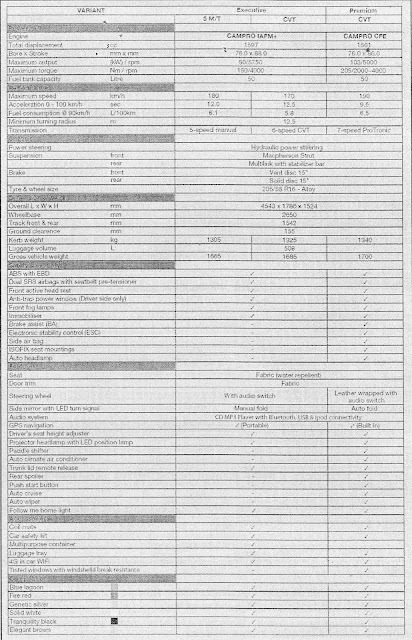 Here is a scanned copy of the Spec Sheet obtained from various sources online. The premium model comes with 7-speed Continous Variable Transmission (CVT) and has up to 103kW power at 5000 RPM, which translate to about 138horsepower (HP) or 140 metric HP (PS). The above power could be obtained due to the CamPro CFE engine that is also being used by the current Proton Exora Bold. That means, it is a light pressure turbocharged engine equipped car. That explained the flat torque of 205nM between 2000 - 4000RPM engine speed. The above is only true for the Premium model and does not apply to the basic model with the more basic CamPro IAFM engine. 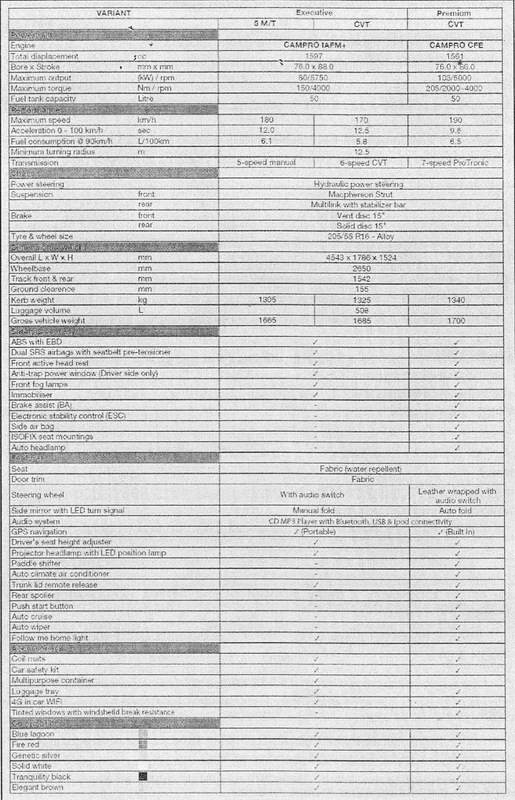 Estimated (unofficial) selling price for the Premium model is at RM78,500 (not sure if on-the-road (OTR) or otherwise), but it is a close RM10K or RM12K when compared to the top line Toyota Vios and Honda City respectively. Lets hope the above is true - and pray that the above will not translate to more reckless modification or driving on Malaysian road. Our Driving school do not equip us to drive a turbocharged car - be it light turbo or otherwise. Do Proton still gives lifetime warranty on its power window system....? Anon 1- if belacan or durian, better. Sustainable. Anon 2 - i hope they scrap that off and provide mechanical self-winding window. Voila! Problem solved. Name aside,i hope this car will Prove itself. Anon - i think Proton is here to PROVE. Whether it will be proven or not, we all will know it within the next 6 mnths when the car is on the raod and driven by the Rakyat. Concept car is good, and yeap, i agree with you, it went too far off from the concept Tuah. This is sort of like a woman wearing all the corrective undergarment where what is see (externally ie Tuah) is not what it is, in reality ( ie Preve). Based on the reviews I've read and the pictures I've seen, it looks like I could be a fan of this car. I'm not so sure about that paint job though. Advantage Toyota Sir - same can be said about me! If i am looking for new car, this one top in the list. Okay, there's no denying that this Proton brand loved and proclaimed by Malaysia as their own version that will soon be as mainstream as the Japanese and Korean ones are a bit absurd. First, they made it they're national cab relegating it to a sub-class of its own (Mercedez and BMW will sue anybody who turns their car into a cab, fyi). So there's still a long way to go for Proton. Billy - Will be unlikely as you are based in US. Don't think Proton has any dealers in US. Though I prefer a more sleek looking exterior, the features of this car sounds so deluxe, from what I've read on this post. I'd definitely use this kind of car if I can afford it. With Toyota and Honda's reputation on building reliable cars, I'd still prefer Vios or Honda over the Preve. No offense meant, I'm just being practical. I have just bought my Proton P3-21A at second hand cars liverpool last week. I'm utterly enjoying every second of it, the power of the engine, the beauty of the design, everything you can think of, and you can't go wrong so buy one. I am sure you know if this happens to you, apply brakes with both feet and shift to neutral & turn off ignition.